Last year Erwin Zijleman wrote a review of the first album of British duo Worry Dolls (read it here: http://wonomagazine.blogspot.nl/2017/07/go-get-gone-worry-dolls.html). Listening to it Wo. send an email to Hans of Q-Bus in Leiden pointing him to Worry Dolls and its tour in the winter of 2018. The instant response was "just booked them". Here's Wo's view on the album. Somewhere fairly high up in the Top 2000 was shown what the music of an add can do to the popularity of a song. 'My Silver Lining' by First Aid Kit became a small hit anyway and features in the list of favourite songs ever since then, having been neglected largely by the mainstream pop lovers before that add. Why do I start with this reference? Because the songs on Go Get Gone and the way of singing of Worry Dolls remind me so much of 'My Silver Lining', the only song I really know of the Swedish duo. A Worry Doll is a small puppet of the Middle American, superstitious sort that can take all your worries away. Who would not want that at some point in time? 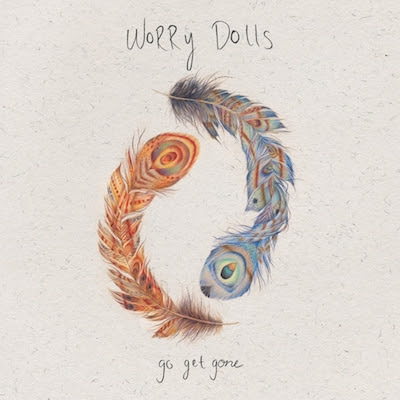 Worry Dolls is a duo that alleviates my mood from the moment I start listening to it. A well chosen name for the band this name is. Worry Dolls may originate from the U.K., the influences and the work, writing and recording, at making this album lie somewhere else though: Nashville, Tennessee. That certainly gives you some pointers where to place this music. The word defining what I hear on the very first sounds on Go Get Gone is lightness. An acoustic guitar playing soft chords before the voices of Rosie Jones & Zoe Nicol start to blend and weave around each other. The lightness of the sound is mixed with a hint of sadness. More because of uncertainty than despair or true pain. It is the not knowing in 'Endless Road' that sets the mood, offset in a beautiful way by a desolately sounding banjo. Not as harsh but certainly in kind with the music of Elliot Brood. In 'Train's Leaving' I hear a kinship with the songs David Sickmen writes for The Hackensaw Boys. Some heartfelt truths are deliberated. "This train is leaving with or without you". It can't be made clearer, I guess. When followed by "I miss you already, but I'm already gone" in the next song called 'Miss You Already', I start to get to have the impression I'm listening to a concept album about leaving. Worry Dolls certainly comes around to some Nashville classic sounds in the aforementioned song. On Go Get Gone that seems to be just fine by me. The voices of Jones and Nicol have that Nashville tear in it, yet can be so very soothing for the soul and the troubled mind alike. Not to mention perfect music after a late New Year's Day party. The more alternative and desolate sounding 'Don't Waste Your Heart On Me' drags Go Get Gone into another direction. The almost drifting music is pulled together by a drum that sets in in parts of the song. It creates two completely different sounds and moods in one song. Just listening to the Worry Dolls on the side of life going about its business, I always ended with singing 'My Silver Lining'. Now I have delved in seriously, I notice that a whole world opened itself for me. True musical beauty is on display for those who want to hear it. The production of Neilson Hubbard leaves so much room for the two voices. Around them there is so much silence. Every instrument and every note played is there for one reason only: To underscore the vocals. All is there to create a mood of vast terrain, empty but for the endless road ahead. No humans in sight, just the wind and the sounds inside your head. Found on Twitter from @WorryDolls: "Thank you for this very sweet review!". You're welcome.